The Stanford large 2 tier 12 light chandelier in polished nickel, with beautifully curved arms and simple clean detailing. A magnificent highly polished nickel 12 light chandelier set out on two tiers, with eight lights on the lower and four on the top. An imposing chandelier, with a central baluster drop rod housing two circular galleries. 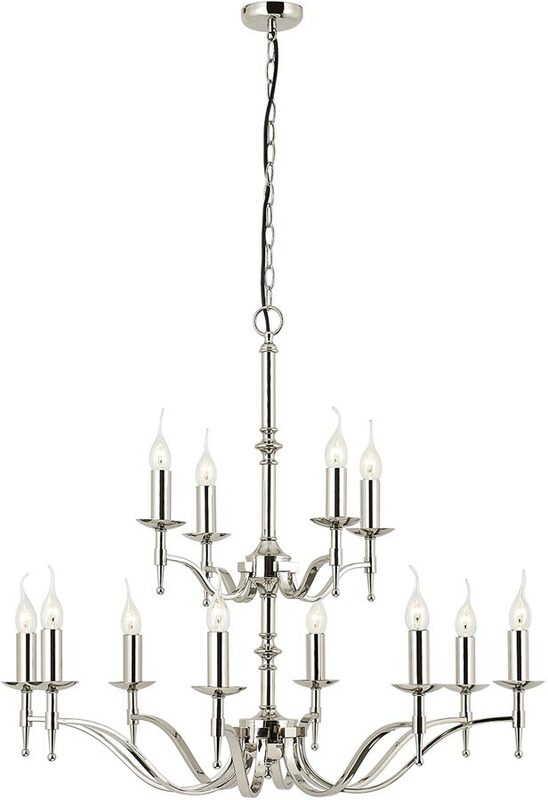 Each of the polished nickel flat section curved arms feature candle drips, candle tubes and lower drop finial. A timeless modern classic perfectly contrasted by the polished nickel, which co-ordinates perfectly with a variety of traditional or modern interior designs. It weighs 13.33 kg and will require careful installation. Please note, this is a large chandelier suitable for larger rooms with high ceilings, a foyer or for hotel applications. Height adjustable at the time of installation, minimum height 87cm, maximum drop 177cm.